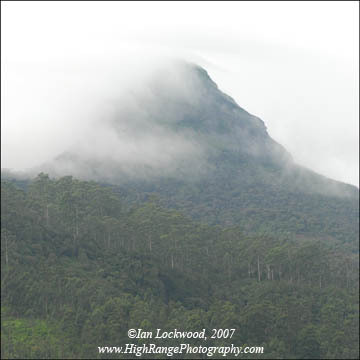 In the last few months I’ve had a chance to visit Sri Pada and the Peak Wilderness forests on several occasions. In December I took my IB Environmental Systems class on a three-day trip to Peak Wilderness. We stayed at the Fishing Hut and used our time to explore and study the montane and cloud forests that surround the sacred peak. The bird and reptile sightings were modest with a highlight being a flock of 10 or so Sri Lanka Blue Magpies around the hut. We hiked up on a forested ridge leading to the peak but stopped short of making it all the way to the main path and summit. I had a chance to visit the peak again when my friends Matthew and Shelly visited over the winter holidays. We had a very nice walk up and night at the top of Sri Pada in early January. Swimming in the large pool below Laxsapana Falls was a marvelous experience that mirrored the sense of awe on Sri Pada’s summit. I’ve been bogged down with school, family and graduate commitments during the last 8 months. All very exciting and invigorating but there hasn’t been a great deal of time to update this. Much of my free time has been devoted to pursuing my second master’s degree through the Lesley University ETL program. The upcoming year promises to be just as busy and challenging as I look towards finishing the program by January 2009. Here are some off the brief glimpses from the study in Cobscook Bay, Maine. Hamilton Cove, a scenic protected area along Maine’s rugged northern Atlantic coastline. We had a chance to visit and do service learning in places like this over our three week study in Cobscook Bay.